North Carolina State University researchers have developed a method that creates devices from hydrogel, a water based poylmer material. The resulting device can be patterned, folded and used to manipulate objects. The research paper, "Reversible Patterning and Actuation of Hydrogels By Electrically Assisted Ionoprinting," is published in the online journal Nature Communications. Hydrogels are polymers that are highly absorbent that can shrink and expand depending on outside conditions like humidity, pH levels, and temperature. Consumer products use hydrogels in contact lenses for its flexibility, baby diapers for its absorbency, and also in adhesives. Hydrogels are most known for its use as a drug delivery system. Hydrogel based capsules are a popular fixture in pharmacies around the world. Previously, hydrogels were developed to react a certain way given certain specific conditions. But with the recent discovery, devices can now be developed that can be actively controlled in real time rather than being just reactive. By being able to control the structure and movement of hydrogel, researchers can create devices for use not only for biomedical purposes but also in the field of robotics. These new devices can be used in the production of soft robots. Soft robots are robots that combine organic chemistry, soft materials science and robotics. These are different from industrial robots in that instead of using gears and motors for movement, soft robots use other means such as chemical reactions or compressed air to move. Soft robots are also made of other materials like rubber and silicon. Researchers from North Carolina State University have developed a new technique for creating devices out of a water-based hydrogel material that can be patterned, folded and used to manipulate objects. The technique holds promise for use in "soft robotics" and biomedical applications. "This work brings us one step closer to developing new soft robotics technologies that mimic biological systems and can work in aqueous environments," says Dr. Michael Dickey, an assistant professor of chemical and biomolecular engineering at NC State and co-author of a paper describing the work. "In the nearer term, the technique may have applications for drug delivery or tissue scaffolding and directing cell growth in three dimensions, for example," says Dr. Orlin Velev, INVISTA Professor of Chemical and Biomolecular Engineering at NC State, the second senior author of the paper. The technique they've developed uses hydrogels, which are water-based gels composed of water and a small fraction of polymer molecules. Hydrogels are elastic, translucent and – in theory – biocompatible. 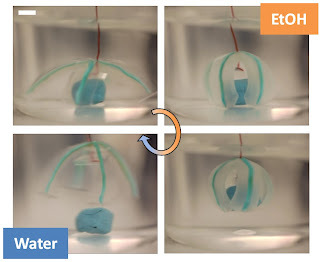 The researchers found a way to modify and pattern sections of hydrogel electrically by using a copper electrode to inject positively charged copper ions into the material. Those ions bond with negatively charged sites on the polymer network in the hydrogel, essentially linking the polymer molecules to each other and making the material stiffer and more resilient. The researchers can target specific areas with the electrodes to create a framework of stiffened material within the hydrogel. The resulting patterns of ions are stable for months in water. "The bonds between the biopolymer molecules and the copper ions also pull the molecular strands closer together, causing the hydrogel to bend or flex," Velev says. "And the more copper ions we inject into the hydrogel by flowing current through the electrodes, the further it bends." The researchers also created a chemically actuated "grabber" out of an X-shaped segment of hydrogel with a patterned framework on the back of the X. When the hydrogel was immersed in ethanol, the non-patterned hydrogel shrank. But because the patterned framework was stiffer than the surrounding hydrogel, the X closed like the petals of a flower, grasping an object. When the X-shaped structure was placed in water, the hydrogel expanded, allowing the "petals" to unfold and release the object. "We are currently planning to use this technique to develop motile, biologically compatible microdevices," Velev says. "It's also worth noting that this technique works with ions other than copper, such as calcium, which are biologically relevant," Dickey says.